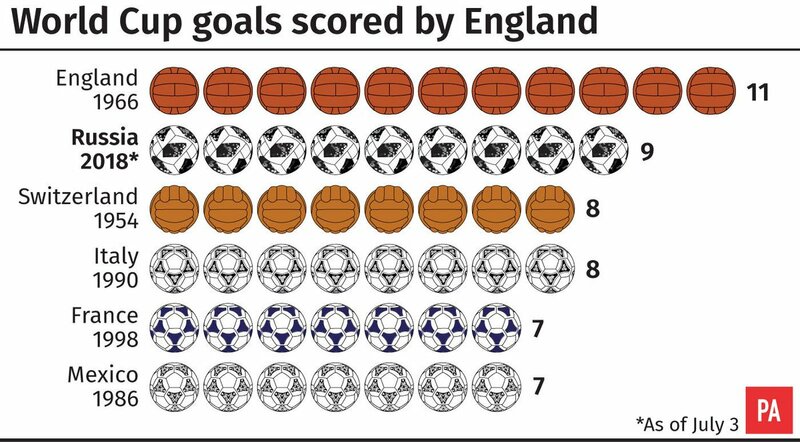 11 - 11 of @England's last 15 goals have been scored or assisted by @SpursOfficial players. Spursy. Yet another game,yet another magnificent performance!! in the words of michael jackson, "coz my friend you have seen nothing, just wait til i get through"
England are into the semi-final of the 2018 FIFA World Cup and one of their best performers has been Jesse Lingard. Manchester United’s magical midfielder has been in flowing form all tournament challenge. With his most impactful display coming against Panama as England won 6-1. Even after they cleaned his clock early on with a rough challenge that probably should have resulted in a penalty (hello, VAR?) Lingard passed whatever rudimentary concussion protocol there was and then just went about his business. In England’s first game against Tunisia, Lingard had ended up drawing a lot of criticism for what was perceived to be a poor performance. And it was, if you look at it through the lens of production. Lingard pissed about six million shots on goal, and each and every one of them would have been buried by Gaz from Huddersfield who just wants players to stop dancing after goals. But in reality what we were witnessing what a sort of miracle, a bit of tactical alchemy that probably would only work on a handful of players in the world. Here was a skinny, quick-moving attacking midfielder. Usually such players get deployed as wingers, although Lingard is clearly better in central zones as a no. 10; but Gareth Southgate went one better than that and pulled him deeper. Pulling him deeper gave him even more scope to contribute. Lingard has always been a hard worker, so putting him in the middle of the game means that he can be constantly involved in all phases of the game. Including build-up and final third impact. Moreover when England don’t have the ball, Lingard’s defensive efforts are magnified and he really sets the tone for the Three Lions. See, the problem with Lingard as a no. 10 is that his whole schtick becomes about running in behind the striker, sort of like a Warrington Lampard. And that’s great if the opponent plays high; but if the opponent is sat deep, then there’s no space to run into and Lingard ends up looking a bit vestigial. This happened a lot this season for Manchester United, which must have been frustrating. So anyway, Gareth Southgate pushed Lingard deeper into central midfield alongside Dele Alli. Both men make their trade playing in attacking midfield roles, but here Gareth Southgate correctly surmised that the whole point of playing 3-5-2 is that the need for defensively solid midfielders is drastically lessened because you have three centre-backs. So England could have just Jordan Henderson at the base of midfield and play their style of play with little consequence. Although one feels that Eric Dier may have to come in against better sides, as Jordan Henderson is as permeable as a wet paper. But anyway, the key thing is that Lingard and Dele are in central midfield, because suddenly there’s all the room in the world ahead of them. Suddenly Lingard can burst from midfield late on, avoid any and all detection by defenders, and alright the finishing was poor against Tunisia but the point is he’ll find himself in great spots from which to score or at least flick the ball on and create chances for his team-mates. Or he can do as he did against Panama and draw a gang-tackle and win his side a penalty, which is pretty good. Or he can stay a bit further back and make use of the space created by his team-mates and his intelligent movement to send dangerous crosses and passes into the box, much as he did when creating England’s second goal against Sweden. Lingard was available as a passing option and then his first-time ball inside was weighted wonderfully and (in a move that was later admitted to be pre-practiced) Dele Alli showed up on the spot to head England into a comfortable league.OR he can associate with the forwards, playing off them whilst simultaneously running into space. Because he’s a central midfielder, one striker can drop to link with him whilst the other can move up to pull the defence out of his way. The result? Lingard in an ocean of space from which he can cause damage. This is exactly what happened for his goal against Panama; Lingard moved forward from a deep zone, playing it in to Raheem Sterling who wonderfully rolled it back into Lingard’s path whilst Harry Kane cleared the road. Lingard was then free to take aim and slap the ball top bins to give England a resounding 3-0 lead. A masterpiece of a goal and a brilliant celebration (apologies to a dance-hating Roy Keane, but much like Wu-Tang Clan, Jesse Lingard is #ForTheKids and you’ll have to deal with that) a sign of what’s to come. Jesse Lingard’s constant movement and endless energy make him an essential member of this England squad, the catalyst that takes Gareth Southgate’s fabulous formation and supercharges it.FIFA’s tracking data for the World Cup so far gives statistical weight to Jesse Lingard’s role as the superconductor. Lingard has covered the most distance by any English player at the World Cup in a single game (15.40km vs. Colombia) and in the tournament as a whole (46.139km) and he’s also made the most sprints with 180. Lingard is the lightning. Everyone around him gets a buzz of being near Jesse, and not just because he’s football’s ultimate hype man, but because he’s a ceaseless bag of movement, tricks and magic who plays every game like he’s having the best time of his life. That energy, both personal and tactical, is truly infectious and exactly what the usually self-serious (and self-sabotaging) England need. ✅ Only seven players have successfully dribbled past him in the league this term. James Maddison has now created more chances than any other player in the Premier League this season.